It is like in your body - the more you 'conjure up' a 'phase conjugating dielectric' (fractally imploding charge) the more your body appears to self-organize. get young, emerge from any disease or wound. This is the same as using a phase conjugate dielectric to time-reverse corrostion etc. 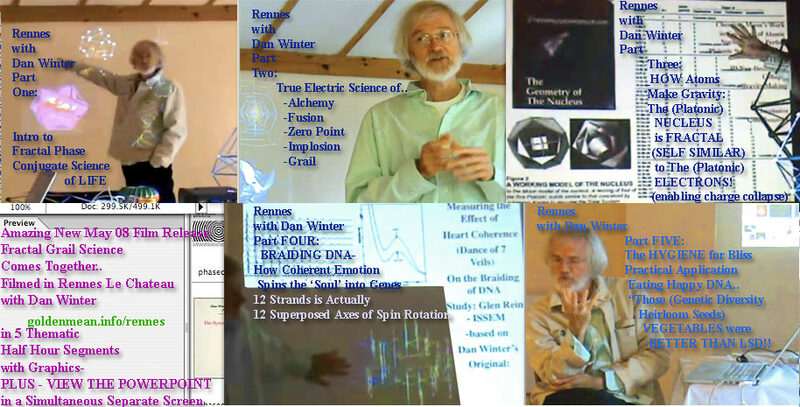 We need to learn to connect the physics of efficient phase conjugation across spectra- from our immature spiritual poetry about how collective mind and pure intention works. The good news - is that this IS the way biology tests for pure intention- in fractal and phase conjugate DNA and tissue. In this way the truly shareable wave - is self sorted ('phase conjugate' - fractality perfects coherence). Knowing how this works - makes death unnecessary - because biology's need to sort only what wave symmetry serves survival can be served directly and consiously: by never again attempting to store in your biology an unshareable wave! ( If you need secrets - this limits your ability to lucid dream- and survive death: because this limits your ability to enter into perfect charge distribution - the definition of what you used to call GOD or the collective unconscious. This compression which becomes implosive distribution/acceleration - mostly in DNA, and the bodies most fractal structures - is the essence of the pure symmetry physics you used to call KARMA.). In Order to Implement this in your life- it is essential to understand how both TIME and MASS (matter) are ONLY names for CHARGE in ROTATION. Rotating fields- emerge from Chaos into LIFE and MIND - ONLY when they are fractal (in both time AND space). This perfects charge compression - and thereby the perfection of charge distribution which electrically defines LIFE and MIND ( ... and causes gravity electrically). In science this is called PHASE CONJUGATION - well known in optics - to create time reversal and self organization - we are now ready to teach the world how phase conjugate electrics cause and enhance life and perception and growth and disinfection- and how phase conjugate magnetics revolutionize water and all purification processes. Hello Dan, I wanted you to know that I haven't been idle. You should be pleased to find that there is now an article on the Wikipedi (English) for Fractal cosmology, and that it mentions the work of El Naschie prominently. 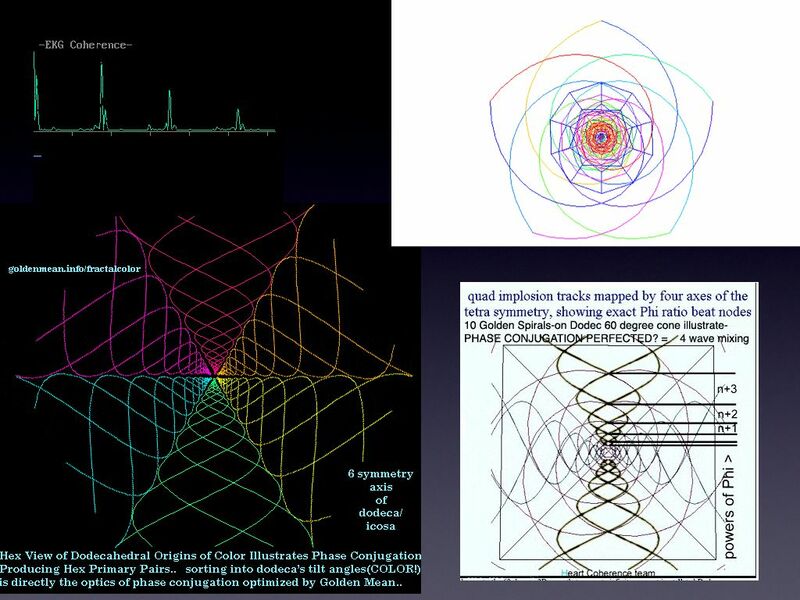 I haven't put up a link to your pages yet, in part because there are so many that pertain to this subject, and I want to find the best one ( goldenmean.info/completefractalcosmology perhaps) to include. Perhaps you can create a new page with minimal content, that has all the links to your other pages on the topic. I am trying to avoid censure, as the predecessor to the page I've created on the Wiki was summarily deleted by the editors. So far; I've toed the line, by keeping my treatment of the subject close to the accepted views of the scientific community, to maintain that all-important neutral point of view. I have not elected to even include a link to my own pages. I intend to make my case stronger first, by writing some papers to show the underpinnings of my work more clearly. - - - But I'm on the path of making that real in a serious way. I'll be presenting my Mandelbrot Set Cosmology theory at the 2nd Crisis in Cosmology Conference, in Port Angeles, Washington, later this year (Sept 7-11). And I've got a book in preparation, with strong publisher interest. So; you can expect more news from me, on this subject. - BTW; I'd be interested to hear if you actually got a reply from Andrei Linde. I've requested permission to use some of his Chaotic Inflation graphics on the Wiki, several times now, but there has been no response. -- Overall it is very useful that Mayan Calender study has swept around the world - especially with young people interested in a new spirituality. In order to gently focus this interest into the best true self-empowerment - it is important that eventually the poetry and pictures- be used to teach PURE UNIVERSAL PRINCIPLES. In this way - instead of resulting in interest in any single culture - like the Mayan - the interest will turn into a universal understanding of how life and spirit become eternal. So - if we were in a biology class- trying to explain - how Mayan calendar study - could lead the kids - to understand the deep mysteries of life and spirit- how could we do that with simple but accurate science? Suppose for example we felt that the entire human genepool was threaten with extinction and we wanted to get some clear scientific message of survival - by studying something like Mayan Calender Science. First - let us be clear - it is not as simple as Jose Arguelles letter to the Pope: " Dear Pope- Please retract your calendar - IT is a mistake!" First of all - it actually is not the Pope (thank goodness) who makes decisions which really affect current culture - it is clear scientific proofs. SO - in order to prove that a Mayan calendar would aid survival we will need some clear scientific evidence- that DNA and survival would be served by choosing a particular timing arrangement - like the Maya. A good example of Jose Arguelles confusion due to lack of science, is the way he talks about the moon as the essence of Mayan calender timing. This would give the impression that the moon and it's timing (rotation period) were somehow sacred. When actually  from a purely biologic perspective the OPPOSITE is the case. The moon IS important, but mostly because it is so poisonous to all of life  it needs to be avoided! If we study agricultural research carefully - we see it is actually necessary to AVOID the moon in order to get a seed to germinate optimally. The moon's timing itself - is not so much sacred - as it is a poison to be avoided. What we need to do here, is to understand WHY the moon is proveably a biologic poison (we all know the full moon prevents seed germination, fills hospitals, and causes Earthquakes). For example  in the Sumerian and Hermetic history we learn that one aspect of the poison sent here when Draconian wars sent our moon, was the way the moon artificially sped up female ovulation  to weaken our genes and psychokinesis. Humanoid women elsewhere  like Sirian we presume, ovulate more slowly  with more power. As biologists we must teach - that the word sacred - means timing which nests or embeds or phase locks with waves and rotations which produce survival and growth. So what is it about the moon that 'fails to embed' as a wave? This is about as close as science can come to defining 'evil'. In order to understand WHY the moon is poison to seed germination (and presumeably to all DNA) versus the SUN which is not, we need to focus on basic principle. This will help us pick out the correct calendar. You see the first thing we need to learn is the TIME like space and mass - are ONLY defined by ROTATION. And the ONLY thing rotating is energy or charge. First: The universe is composed - of waves of energy - (some call it ether or charge). The substance is compressible and stores inertia. The only way mass or matter is created is when the ROTATION of the energy stores the inertia which we then call creation or mass. To be able to keep the little rotating gyroscopes of waves of energy called MASS or MATTER- able to stay in one place - and resist the change of position - requires this fundamental requirement - INERTIA - which is defined as MASS. BUT - for rotating waves in order to have the ability to stay in one place - without flying out of their little rotating circles - there must be a centering or centripedal force also sucking their charge or energy -toward center. This centripedal force - is called GRAVITY- and physics sadly has ignored the cause of gravity. Because physics sadly is ignorant of the cause of gravity (it is fractality), they are unable to design environments which sustain gravity and therefore atmosphere. As we are about to see - the charge which is distributed efficiently in a fractal field - is also the key to the maintenance of all living thing ( biologic architecture). Einstein had learned that the cause of gravity was infinite constructive wave collapse- but he did not know that fractals perform infinite compression. To know how this works electrically - is mostly to visualize a rose. But if you actually want the 3D geometry just keep extending the edges straight out from a pent dodecahedron. This dodeca / icosa / dodeca -is the perfect 3D electric fractal - and is so profound - you could spend your life discovering in there every great mystery INCLUDING the holy grail in DNA. If you actually study HOW fractality allows this infinite perfect collapse - you come to realize that this rose like shape of waves - is not just the cause of gravity - but also the cause of life, consciousness, and all centripedal forces. For this article - we are going to focus on the electrical cause of life - because it is here we are going to learn about Calendars. First - all molecules that want to become part of life - have to arrange themselves into a fractal - because this allows them to gather and compress energy waves (charge) efficiently. The beautiful secret of life - is that it always depends on this fractal ability to gather energy and charge. SO all biology is essentially fractal (like roses, ferns, onions, pine cones) for this reason. This is essentially why today - even the cover of science magazines are proclaiming the Universe is FRACTAL and the vacuum is fractal. It is because only this pattern of waves allows the most number of waves to compress and thereby avoid chaos. SO- now we get back to our Maya question. The reason the moon is essentially poison to every living thing - is because - as the NASA siesmic data, and the Sumerian history show - it is hollow and built around an artificial metal skeleton. (That colorful history is beyond the subject of this story - but please check out: goldenmean.info/therestofthestory - essentially the "fallen" (Nephalim refers to genetic disaster due to failure to charge ignite DNA- 'ground hog day' to George Bush culture) Draco Annunaki were very unskilled with gravity orbits when they were shooting with artificial planets trying to conquer the solar system. References: goldenmean.info/invasion , also  the moon as hollow, metal, artificial: see- www.redicecreations.com/specialreports/2006/01jan/moon.html ). Gurdjieff was correct, coherent (Fractal / Bliss) emotion feeds the SUN, while INcoherent (parasitic) emotion feeds the moon. This is why, when world leading remote viewer for the CIA, Ingo Swann- came back from his assignment to check out the ET's (greys and lo end dracos) infesting the back side of the moon - he was scared pretty much out of his wits. Finally - physics can teach the principle. Parasites go where fractality doesn't. In the same way, if you surround your aura with bliss - charge fractality, parasites and their non-implosive DNA is burnt away -with all waves which are unshareble (cannot embed into implosive phase conjugate discipline). The moon is the place where people who want to believe the God principle is OUTSIDE themselves- go. Eat a dead idea (from parasite priests) and you attract parasites to your aura. Eat dead (not enzyme alive) food, you attract parasties to your stomach. In each case- the parasite serves a function: biofeedback which says - become SELF empowered or be consumed. Anyone who suggests you worship the moon is sucking you in to - feed your aura to parasites. Because the moon is hollow and metal and not alive - so it radiates the same kind of murderous electric field as aluminum and steel buildings - which can measureably prevent a seed from germinating. The only things that radiate electric fields that serve life - are called FRACTAL or in science PHASE CONJUGATE DIELECTRICS. Steiner called this Etheric formative force, Reich called it ORGONE - and Catholics call it Spirit - Orientals call it CHI. The problem is - all these names were invented by people who do not know how a capacitor stores charge. When the charge field gets fractal or phase conjugating - it creates perfect distribution of charge - and THAT is called LIFE. SO - now we are ready to ask which calendars will create life. Obviously - the need is to place your biology in a wave nest of charge - in such a way as it can constructively - by FRACTALITY- gather the most number of (capacitive) energy waves. We can actually prove by measurement - that the most number of harmonics in the charge field- predict which food has most life ( www.goldenmean.info/biophoton ). This is precisely what all those words like CHI and ORGONE and BARRAKAH and ETHERIC and SPIRIT referred to. There is only ONE kind of wave in the universe - and that is the energy of ether wave called CHARGE. This becomes the unified field precisely when you understand fractality. For example as we said - fractality is the electric cause of gravity. The way we prove fractality in space causes life and growth - is just to plant our paramagnetic stones like a rose or fractal - and prove this improves seed germination ( goldenmean.info/germination ). This is why - the original - 'sacred' plan for cities like Prague are specifically a rose. This is how life is created. We can also prove that FRACTALITY in TIME - also creates seed germination: We place these same dolmen in their array - which creates the seed germinating electric field - IN A FRACTAL PATTERN IN TIME. We need to understand deeply WHAT is a fractal in time- in order to teach the principle - because this is what allows us to best gather the infinite biologic charge rotating - which sustains life. So - understanding that fractality in TIME is also the key trick - to making life. Why would it be true? Remember- time is only a name for ROTATION. And again - the only thing rotating is charge or energy. By placing yourself in the center of a fractal pattern of rotating charge in SPACE AND TIME - is how you get LIFE. The book SPIRAL CALENDAR by CAROLAN illustrates how key event histories in TIME - when they emerge from chaos - specifically - fit a GOLDEN MEAN SPIRAL in time. It is pretty simple to take that principle to predicting the stock market (Prechter and Elliot Wave - based on Golden Ratio. (picture here). So - if you want not just LIFE but also MIRACLES and SYNCHRONICITY in your life - how do need to arrange the key biologic events to fit a Golden Spiral fractal in TIME. This is clear biologic principle. So - where do we find the Fractality in TIME in the Mayan calendar. Here is where Jose Arguelles - did something right. He showed that the essential centerpiece of the Mayan calendar - was the pattern ARRAY of the Solar flares. And further he showed that this pattern fit the 64 I Ching - Codon array of DNA (the permutations of 3). So- is the reason to study the Mayan calendar to learn Solar Physics? This is essentially the position taken by Maurice Cotterell - in his excellent work : Tutankhamon Prophecies. But it is not enough to learn that the Solar output is directing biology. It is necessary to see deeply into why. In order to 'embed' or nest in that- we need to discover the FRACTALITY in the 'Heart of the Sun'. So- the real message of calendars is that you need to embed yourself in the real rotating charge bodies of living things- so that you can absorb maximum energy inertia. If you do this fractally (with perfect compression) you produce survival. Let's try to find an example: we all know you need to avoid the moon to get a seed to germinate (Steiner's planting calendar etc) , and avoid solar maximum to avoid storms etc- but what is the big picture? The big picture is that that Sun is a fractal and living electric body which invites us thru her energy lens into stars. Listen to the story of the Essene mystic Grace- to her story of going thru the sun ( goldenmean.info/grace ). There is a certain time when the Sun produces fires that prevent human ovulation. Cotterell says this is the essential message of Maya's LID OF PALENQUE. From the Sumerian records he says we know the date when Thoth - Son of Enki - left Egypt and essentially became Quetzlcoatel. The message did not change- only the personality face. There are certain times - when the Sun is particularly inviting us to embed or nest in her large fractal rotating wave envelope. The Essene's went into the Sun - with their aura and their perceptual body - at certain times. An example is a sunset. At a certain point - particularly if you are next to water- the Sun's light beams will reflect on the water- just before Sunset - in a huge continuous river. At that moment- if the AIR itself is fractal - and if you have prepared your aura or KA into coherence - then you can go into the Sun. The center of the Sun is cool and inviting to your consciousness- if you prepare. And how do you know when the air is fractal? Well - the Russians have a device to measure it - called IGA. For our purpose- we will conclude this article with a little lesson on fractal color in order to explain. You see- rainbows happen ONLY when the AIR is fractal. This means charge dense. The reason fractal air causes rainbows - is because electric fractal phase conjugation is the cause of color... The sorting into rainbows you call color requires the same phase conjugate electric fractality among photons - which your TIMING requires in order to absorb the charge or energy called life force and vitality. Article to be continued... next time : THE GREEN FLASH. Enfolding reciprocity being the concrescent pathway out of chaos to unified field. hi, be advised the information is available to you -to: implement correct field theory measures to properly empower your meditation..
(your current purely octave / hex based symmetries are imbalanced - and do not implement the complementary pent / phi cascade needed , see the proof goldenmean.info/caughtinthematrix , DNA geometrics prove the offset balance of how pent is arrayed among hex. >> You can help make this historic event happen: Please forward this announcement immediately to anyone you know who shares an affinity for the infinite possibilities of the human spirit. Thank you! > Our angelic collaborators have suggested that we move 444 people into the Grand Formation in West Yellowstone (www.atouchofangels.net/geometry.htm). Additionally, that 144,000 people around the world also participate individually or in groups wherever they are, to expand and amplify these vibrations of peace around the world. This global participation is essential, passing on the "signal" like cell phone towers. Each individual connecting to, and participating in this, along with standing in the sacred geometric formations, exponentially increases the energies involved. > DISCUSSION FORUM ON LOCAL LOGISTICS. L’étude du Calendrier Maya s’est propagée un peu partout dans le monde en particulier auprès des jeunes, adeptes d’une nouvelle forme de spiritualité, ce qui s’avère très utile. Il est important que cet intérêt conduise vers une véritable souveraineté de l’individu, et que l’aspect poétique et imagé permette d’appréhender les PRINCIPES FONDAMENTAUX UNIVERSELS. L’intérêt que suscite une culture comme la culture Maya doit s’étendre à une compréhension plus globale et universelle de la notion d’éternité appliquée à la vie et à l'esprit. Supposons que nous soyons en cours de biologie et tentions d’expliquer comment l’étude du calendrier maya peut permettre aux enfants d’appréhender les mystères profonds de la vie et de l'esprit. Comment nous y emploierions nous tout en recourant à une science à la fois simple et précise ? Supposons que l’espèce humaine par exemple soit menacée, et que nous recherchions des messages scientifiques clairs pour la survie dans l'étude de quelque chose comme le Calendrier Maya. D’abord parce que ce n’est pas le pape (et Dieu merci) qui décide de modifier nos coutumes actuelles mais des preuves scientifiques tangibles. Ainsi, pour prouver qu'un calendrier maya améliore notre survie, nous devrons démontrer, par la science, qu’une disposition particulière du temps, comme celle maya, est favorable à la survie et à l'ADN. Une autre erreur de José est de considérer la Lune comme élément primordial dans la disposition maya du temps. Si nous étudions attentivement l’agronomie, nous voyons en fait qu’il est nécessaire d’ÉVITER la lune pour obtenir la germination. L’établissement du temps en fonction de la lune n’est par conséquent pas si sacré, si s’agit d’un poison à éviter. Ce qu’il nous faut ici comprendre c’est pourquoi la lune d’évidence est un poison pour la biologie, (nous connaissons tous les effets de la pleine lune, elle empêche la germination, emplit les hôpitaux et accentue la fréquence de tremblements de terre). En tant que biologistes, nous présumons que le terme sacré s’applique à un calendrier en phase avec les mouvements ondulatoires et giratoires favorables à la vie et à la croissance. Qu'en est-il alors, d’une lune vibratoirement hors phase, ou hors synchronicité avec la biologie ? Nous sommes au plus près de ce qu’on pourrait qualifier de « EVIL » en science, ce qui est (plutôt que diabolique), « contraire à la vie », [« EVIL » en Anglais étant « LIVE » (la vie) mais inversé]. Comprendre POURQUOI la lune, contrairement au SOLEIL, est préjudiciable à la germination (et probablement à tout ADN), nous devons nous attacher aux principes essentiels qui nous permettrons le choix du calendrier adéquat. La première chose que nous devons comprendre c’est que le TEMPS, l'espace et la masse sont SIMPLEMENT définis par la ROTATION. Et que la SEULE chose en rotation est l'énergie ou la charge. L'univers, premièrement, est composé d’ondes d'énergie (que certains appellent éther ou charge). Cette substance est compressible et peut accumuler l’inertie. La seule façon de créer la masse (ou la matière) est la ROTATION de l'énergie qui accumule l'inertie, plus tard appelée la masse (ou la création). Maintenir ces petits gyroscopes d’ondes d'énergie, appelés MASSE ou matière, en rotation, capables de rester en un point et de résister au changement de position, requiert une force fondamentale, la force d’ INERTIE, qui est définie par la MASSE. ET pour que ces ondes demeurent en un même point de rotation (sans sortir de leurs petits cercles de rotation), requiert aussi une force de centrage (ou centripète) qui aspire la charge ou énergie vers le centre. Cette force centripète est cette force de GRAVITÉ, dont les physiciens malheureusement ignorent la cause. Et c’est parce que malheureusement ils en ignorent la cause (la fractalité), qu’ils sont dans l’incapacité de concevoir des environnements capables de stabiliser la gravité et en conséquence l'atmosphère. Comme nous allons voir, la distribution efficace de la charge dans un champ fractal est ce qui permet l’expansion de toute forme de vie (ce à quoi s’emploie l’architecture biologique). La (force de) gravité résulte de la FRACTALITÉ ou AUTO-SIMILITUDE entre les ondes à extérieur (les électrons) et les ondes à l’intérieur (le noyau). Cette fractalité signifie que les ondes d'énergie dans l'atome s'effondrent constructivement vers le centre exactement comme une rose. Et puisque la proportion du nombre d'or est la forme parfaite de la fractalité, la nouvelle physique peut prouver qu’effectivement la fractalité du Nombre d’or est la CAUSE de la gravité ou de la force centripète (goldenmean.info/goldenphysicsvindicated). Einstein avait compris que la cause de la gravité est l’effondrement ondulatoire, constructif, infini, mais ne savait pas que cette compression infinie est réalisée par les fractales. Pour comprendre comment cela fonctionne électriquement, visualisez une rose. Et si vous voulez comprendre ce qu’est un champ fractal électrique en 3 D, visualisez un dodécaèdre pentagonal dont vous prolongez tous les côtés dans une succession infinie et alternée de dodécaèdre, icosaèdre, dodécaèdre... C’est si profond que cela permet d’expliquer les principes de la plupart grands mystères, Y COMPRIS le Graal dans l'ADN. Si vous étudiez COMMENT la fractalité permet cet effondrement infini, parfait, vous réalisez qu’en fait cette forme ondulatoire de rose n'est pas seulement la cause de la gravité, mais aussi de la vie et de la conscience, et de toutes les forces centripètes. Nous allons nous concentrer dans cet article sur la cause électrique de la vie, car c’est ainsi que nous comprendrons les calendriers. Premièrement, les molécules, voulant intégrer la vie, doivent présenter des structures fractales pour s’assembler et comprimer l'énergie ondulatoire (la charge) efficacement. Le secret merveilleux de la vie est toujours dans cette capacité fractale d’assembler l'énergie et la charge. C’est la raison pour laquelle toute la biologie (les roses, les fougères, les oignons, les pommes de pin…) est essentiellement fractale. Pourquoi en ce cas nos villes ne ressemblent-elles pas à des roses ? Une architecture vivante est en fait toujours fractale car ainsi elle encourage la vie, www.goldenmean.info/architecture. L’architecture biologique se définie électriquement par sa capacité de créer des structures suffisamment fractales pour rassembler, respirer, et rayonner la charge. Des matériaux comme l’acier ou l’aluminium MALHEUREUSEMENT rayonnent des champs électriques tout à l’opposé, avec un nombre réduit d’harmoniques. Les champs électriques vivants rayonnent l’ « INCLUSIVITÉ » HARMONIQUE, incluant le PLUS grand nombre de fréquences harmoniques. Quand votre médecin par exemple veut prédire l’espérance de vie statistique de votre système immunitaire, il recourt en examinant la Variabilité de votre Fréquence Cardiaque (Heart Rate Variability HRV), aussi à étudier l’Inclusivité harmonique (et fractale) de votre cœur. Il s'avère que selon ce principe, ce qui peut contenir le PLUS grand nombre d'ondes ou fréquences de charge VA TOUJOURS vivre le plus longtemps. Cela a été effectivement été vérifié pour les harmoniques de la voix, et même les harmoniques sonores des forêts (théorie de l’habitat bioacoustique www.goldenmean.info/desertification ) ! C'est essentiellement pourquoi aujourd'hui, même les couvertures de revues scientifiques proclament l'Univers FRACTAL et le vide fractal. Car cette structure d’ondes seule permet au plus grand nombre d'ondes de comprimer constructivement et en conséquence évite le chaos. Revenons à la question Maya. La raison pour laquelle la lune est essentiellement toxique, est qu’elle est creuse et faite de métal, comme les données sismographiques de la NASA le prouvent et les textes sumériens le relatent. (Cette histoire dépasse le propos ici, mais elle est plus détaillée à www.goldenmean.info/therestofthestory). En résumé, des Dracos Annunakis, peu évolués, cherchant à conquérir la galaxie solaire, étaient très maladroits, quand ils essayaient d’envoyer des planètes artificielles, avec les orbites gravitationnelles). Parce qu'elle est creuse, de métal, et inerte, elle rayonne le même type de champ électrique délétère que des constructions en aluminium ou en acier, empêchant mesurablement la germination. Les matériaux qui rayonnent des champs électriques favorables à la vie, sont dits FRACTAUX, ou plus savemment, DIÉLECTRIQUES, et en CONJUGAISON DE PHASE. Steiner parlait de forces formatives éthériques, Reich d’ORGONE, et les Catholiques parlent d’Esprit et les Orientaux de CHI. Le problème c’est que tous ces noms ont été inventés par des gens qui ne savent pas comment un condensateur emmagasine la charge. Lorsque le champ de charge devient fractal ou qu’il entre en conjugaison de phase, il crée une distribution parfaite de charge, qu’on appelle LA VIE. La nature centripète, essentiellement FRACTALE des ions négatifs, en est l’illustration. Elle peut enrayer l'infection. Dans les liquides, cette fractalité électrique est appelée potentiel REDOX. Cette mesure vous permet immédiatement de savoir quel liquide favorise la vie, ou au contraire la maladie. (Elle correspond scientifiquement à la disponibilité en électrons à réagir, qui correspond à l'efficacité de la distribution de la charge, ce que permettent PRÉCISÉMENT la fractalité et la VIE). DONC nous sommes prêts maintenant à nous demander quels sont les calendriers qui vont créer la vie. De toute évidence, il s’agit d’insérer notre biologie, dans un champ de charge ondulatoire, de manière à ce qu’elle puisse rassembler constructivement, par FRACTALITÉ, le plus grand nombre d'ondes d’énergie (capacitives). Nous pouvons effectivement prouver par la mesure que le plus grand nombre d'harmoniques dans le domaine des frais de prédire qui a le plus la vie des aliments (www.goldenmean.info / biophoton). C'est précisément ce que tous ces mots comme CHI et ORGONE et BARRAKAH et ETHERIC et SPIRIT visés. Il n'ya qu'un seul type de vague dans l'univers - et c'est l'énergie de l'éther vague appelé SUPPLEMENT. Cela devient le champ unifié précisément lorsque vous comprenez fractality. Par exemple, comme nous l'avons dit - fractality électrique est la cause de la gravité. La façon dont nous prouver fractality causes dans l'espace de vie et de croissance - est juste de planter notre paramagnétique pierres comme une rose ou fractale - et de prouver ce qui améliore la germination des graines (www.goldenmean.info / germination). C'est pourquoi - de l'original - "sacré" plan de villes comme Prague sont spécifiquement une rose. Voilà comment la vie est créé. Nous pouvons également prouver que dans FRACTALITY TIME - crée aussi la germination des graines: Nous plaçons ces mêmes dolmen dans leur gamme - qui crée les graines germent champ électrique - FRACTAL DANS UN PLAN DANS LE TEMPS. Nous devons comprendre profondément QUEL est une fractale dans le temps afin d'enseigner le principe - parce que c'est ce qui nous permet de mieux recueillir l'infini biologique charge tournante - qui entretient la vie. Donc - comprendre que dans fractality TIME est aussi la clef astuce - à rendre la vie. Pourquoi serait-il vrai? Rappelez-temps est seulement un nom pour ROTATION. Et encore une fois - la seule chose rotation est en charge ou de l'énergie. En plaçant vous dans le centre d'une structure fractale de rotation en charge ESPACE ET LE TEMPS - est de savoir comment vous obtenez LIFE. Le livre SPIRAL CALENDRIER par CAROLAN illustre comment événement clé dans l'histoire TEMPS - quand ils sortent de chaos - en particulier - l'ajustement un GOLDEN MEAN SPIRAL dans le temps. Il est assez simple à prendre ce principe pour prédire le marché boursier (Prechter et Elliot Wave - basé sur Golden Ratio. (Photo ici). Alors, - si vous voulez, non seulement LIFE mais aussi MIRACLES et SYNCHRONICITY dans votre vie - comment devons Organiser les principaux événements biologiques pour ajuster un Golden Spiral fractale en TEMPS. Ce principe est clair biologique. Donc - où allons-nous trouver dans la Fractality TEMPS dans le calendrier maya. C'est là que Jose Arguelles - avez quelque chose de bien. Il a montré que le pivot de l'indispensable calendrier maya - a été le motif de la ARRAY éruptions solaires. Et de plus, il a montré que ce modèle digne du 64 I Ching - Codon tableau de l'ADN (les permutations de 3). - Donc c'est la raison pour étudier le calendrier maya pour apprendre physique solaire? Il s'agit essentiellement de la position adoptée par Maurice Cotterell - dans son excellent travail: Prophéties Toutankhamon. Mais il ne suffit pas d'apprendre que le solaire est sortie diriger la biologie. Il est nécessaire de voir en profondeur pourquoi. Afin de "embed" ou en nid-que nous avons besoin de découvrir les FRACTALITY dans le «Heart of the Sun". - Donc le véritable message de calendriers, c'est que vous devez vous inscrire dans la réalité les organes chargés tournante de la vie, les choses de telle sorte que vous pouvez absorber l'énergie maximale inertie. Si vous optez pour cette fractally (parfait avec compression) vous produisez survie. Essayons de trouver un exemple: nous savons tous que vous devez éviter de la lune pour obtenir une semence de germer (Steiner plantation calendrier etc), et d'éviter au maximum l'énergie solaire pour éviter les tempêtes etc-mais ce qui est le grand tableau? La grande image est celle que Sun est une fractale et électriques organisme vivant qui nous invite à travers ses lentilles énergie dans les étoiles. Écoutez l'histoire de la mystique Esséniens Grace à son histoire, de passer par le soleil (www.goldenmean.info / grâce). Il ya un certain temps lorsque le Soleil produit des incendies de l'homme qui empêchent l'ovulation. Cotterell explique ceci est le message essentiel de Maya's COUVERCLE DE PALENQUE. Du sumérien enregistre-t-il nous connaissons la date de Thoth - Fils de Enki - quitté l'Égypte et devint essentiellement Quetzlcoatel. Le message n'a pas changé seulement de la personnalité visage. Il ya certaines fois - lorsque le Soleil est particulièrement nous invitant à intégrer ou nicher dans sa grande vague tournante fractale enveloppe. Les Esséniens's allé dans le Sun - avec leur aura et leur corps perceptuelle - à certains moments. Un exemple est un coucher de soleil. À un certain point - surtout si vous êtes à côté de l'eau du Soleil faisceaux lumineux se reflètent sur l'eau juste avant de Sunset - dans un immense fleuve continu. A ce moment-même si l'AIR est fractale - et si vous avez préparé votre aura, ou KA en cohérence - alors vous pouvez aller dans le Soleil. Le centre du Soleil est cool et invitant à votre conscience, si vous préparer. Et comment savez-vous quand l'air est fractale? Eh bien - les Russes ont un appareil pour mesurer celle-ci - appelée IGA. Pour notre but, nous allons conclure cet article avec une petite leçon sur les fractales couleur afin d'expliquer. Vous voyez-arcs-en-ciel se produire lorsque l'SEULEMENT AIR est fractale. Cela signifie charge dense. La raison fractale air causes arcs-en-ciel - est électrique car fractale conjugaison de phase est la cause de la couleur ... Le tri dans les arcs-en-ciel de couleurs vous appelez requiert la même phase électrique fractality conjugué entre photons - qui requiert votre TIMING afin d'absorber les frais ou d'énergie appelée force de vie et de vitalité. Article à suivre ... La prochaine fois: THE GREEN FLASH. PHASE CONJUGATING - GOLDEN RATIO - IDENTIFYING PEAK PERCEPTION / Bliss. note in the above- at the black arrows in the brainwave power spectra plot (left bottom)-the lower black arrows (right vs left hemisphere) point to the momentary onset of ALPHA coherence, the upper black arrow - points to the place where intermittantly the EEG harmonics RATIO (from alpha TO beta) becomes GOLDEN MEAN - indicated a moment of (phase conjugating) PEAK PERCEPTION / BLISS.